O God, who enlightened the Slavic peoples through the brothers Saints Cyril and Methodius, grant that our hearts may grasp the words of your teaching, and perfect us as a people of one accord in true faith and right confession. Through our Lord Jesus Christ, your Son, who lives and reigns with you in the unity of the Holy Spirit, one God, for ever and ever. St. Cyril was a priest and a philosopher and accompanied his brother St. Methodius to Moravia to preach the Gospel. They both perfected a Slavonic alphabet which is now known as the Cyrillic alphabet and translated the liturgy into this language. They were summoned to Rome, where Cyril died on this date in 869, and Methodius was consecrated bishop and sent to Pannonia. He died on April 6, 885, in Velehrad, Czech Republic, after working tirelessly on spreading the Gospel. According to the 1962 Missal of Bl. John XXIII the Extraordinary Form of the Roman Rite, their feast is celebrated on July 7. According to the 1962 Missal of St. John XXIII the Extraordinary Form of the Roman Rite, today is the feast of St. Valentine. St. Valentine, a priest of Rome, was martyred, it would appear, in about 270. On the Flaminian Way, at the site of his martyrdom, Julius I built a basilica which was visited frequently. 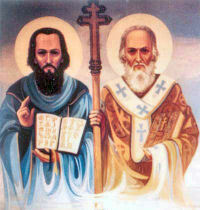 Cyril and Methodius, the apostles of the Slavs, were brothers who hailed from Thessalonia. After receiving an excellent education, they were sent by the Eastern Emperor Michael III (842-856) into the kingdom of Grand-Moravia; through great effort and in spite of tremendous difficulties they converted the Slavonic nations. They translated the Bible into Slavonic and devised a kind of writing, called glagolitic, which even to the present day is used in the liturgical services of some Eastern rites. In 867 the two brothers came to Rome, were met by Pope Hadrian II (867-872) and the whole papal court. They gave a report of their labors but encountered opposition on the part of jealous clergy who took offense, it was said, because of their liturgical innovations. Cyril and Methodius explained their methods and from the Pope himself received episcopal consecration (868). Soon after, Cyril died at Rome, only forty-two years old, and was buried in St. Peter's; later his body was transferred to San Clemente, where his remains still rest. His funeral resembled a triumphal procession. Methodius returned to Moravia and labored as a missionary among the Hungarians, Bulgarians, Dalmatians, and the inhabitants of Carinthia. Falling again under suspicion, he returned to Rome and defended the use of the Slavonic language in the liturgy. The Pope bestowed upon him the dignity of archbishop. After his return to Moravia, he converted the duke of Bohemia and his wife, spread the light of faith in Bohemia and Poland, is said to have gone to Moscow (after the erection of the See of Lemberg), and to have established the diocese of Kiev. After his return he died in Bohemia and was buried in the Church of St. Mary at Velehrad, the services being conducted in Greek, Slavonic, and Latin. Patron: Slavic Peoples; Bohemia; Bulgaria; Bosnia; Croatia; Czech Republic; Czechoslovakia; ecumenism; Europe; Moravia; Russia; unity of the Eastern and Western Churches; Yugoslavia; ecumenism; against storms. Symbols for St. Cyril: With Saint Methodius; Oriental monk holding a church with the help of Methodius; surrounded by Bulgarian converts; wearing a long philosopher's coat. Symbols for St. Methodius: With Saint Cyril; Oriental bishop holding up a church with Saint Cyril; Oriental bishop holding a picture of the Last Judgement. Learn more about the Missionaries to the Slavs. Read Pope Leo XIII's encyclical, Grande Munus (On Ss. Cyril And Methodius) and Pope John Paul II's encyclical, Slavorum Apostoli. If you are interested in languages you can learn more about the Glagolitic alphabet created by St. Cyril and Methodius. While in prison, Valentine was tended by the jailer, Asterius, and his blind daughter. Asterius' daughter was very kind to Valentine and brought him food and messages. They developed a friendship and toward the end of his imprisonment Valentine was able to convert both father and daughter to Christianity. Legend has it that he also miraculously restored the sight of the jailer's daughter. The night before his execution, the priest wrote a farewell message to the girl and signed it affectionately "From Your Valentine," a phrase that lives on even to today. He was executed on February 14th, 273 AD in Rome. The Martyrology says, "At Rome, on the Flaminian Way, the heavenly birthday of the blessed martyr Valentine, a priest. After performing many miraculous cures and giving much wise counsel he was beaten and beheaded under Claudius Caesar." Patron: Affianced couples; against fainting; bee keepers; betrothed couples; engaged couples; epilepsy; fainting; greeting card manufacturers; greetings; happy marriages; love; lovers; plague; travelers; young people. Symbols: Birds; roses; bishop with a crippled or epileptic child at his feet; bishop with a rooster nearby; bishop refusing to adore an idol; bishop being beheaded; priest bearing a sword; priest holding a sun; priest giving sight to a blind girl. Read the Golden Legend account of St. Valentine's life. Pray to St. Valentine for an increase of true, sacrificial love within marriages. Make Valentines for those closest to you — your family and friends. If you have children, teach them to make valentines from red construction paper and doilies. Introduce your family to some of our delicious Valentine's day recipes, such as heart cake or peppermint mousse. Begin to read and discuss some of St. John Paul II's works on marriage; for example, Love and Responsibility or his The Theology of the Body Human Love in the Divine Plan (Parish Resources).